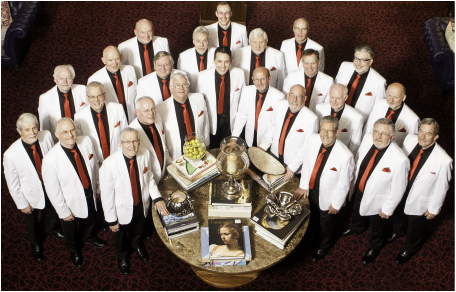 We are a male harmony choir specialising in the barbershop style of choral singing. We are Ireland’s longest established barbershop chorus having being formed in 1980 and have been a member of the Irish Association of Barbershop Singers (I.A.B.S.) ever since it was inaugurated in 1988. The Polyphonics are the current Irish Male Barbershop Chorus Champions having won the crown for the 15th time in October 2015. We also won the 2012 National Light, Jazz and Popular Music Competition in the Cork International Choral Festival, our second time winning the competition. We primarily provide entertainment for weddings and events and regularly perform in concerts and fundraisers for other choirs. In recent years we have performed at The Maritime Festival in Dublin and Sproai Festival Waterford. We have also performed in the Cork Opera House, the Everyman Palace Theatre Cork, The Helix in Dublin and Cork City Hall. We are regular performers at the Cork Culture Night, St Patrick’s Weekend Festival Cork and The Lord Mayor’s Picnic, Cork and have appeared on T.V. (RTE and TG4) and performed on Cork’s 96FM (local radio). The Polyphonics are currently under the musical direction of Patrick D'Alton.